/ Why use Photogrammetry for Surveying and Mapping? Photogrammetry has a long history of use in the surveying and mapping field. Photogrammetry can be used for point measurements or for generating point clouds. Compared to its chief rival, LiDAR (Laser Imaging, Detection and Ranging), point-cloud generation from photogrammetry is cost-effective, portable, and versatile, so it has always had a loyal following among practitioners. In recent years, however, interest in photogrammetry among surveying professionals has been enjoying a major boom. 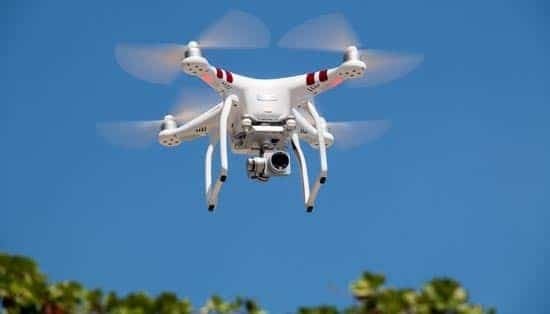 This trend has been catalyzed by the rise of affordable, commercially available aerial drones, or UAVs for short. UAVs provide a number of advantages which make photogrammetry even more accessible, and has led to a renewed interest in the technology. To understand why, let’s first take a look at what makes photogrammetry so compelling for some forms of ground-based surveying. Photogrammetry is the process of generating a 3D model from a set of 2D photographs. In surveying, this is done by taking two or more images of the same point from different angles. These images are then loaded into a photogrammetry software suite like PhotoModeler, which displaces the images by a baseline, and uses this data to triangulate the elevation of that point. Take enough of these images , and you can create a detailed mesh model of the entire area. The key technological alternative to photogrammetry for dense point cloud modeling is LiDAR, also commonly known as laser scanning. LiDAR works by emitting a pulsed laser towards the point and measuring the time it takes to be reflected back. Thus, unlike photogrammetry, it only requires a single direct “line of sight”. This can make it better suited for particular applications, such as mapping vegetation-heavy areas. It’s cost-effective. LiDAR equipment is expensive and requires specialized expertise to operate properly. Photogrammetry requires only a DSLR camera and software that can be run on a standard computer. It’s easily available. Due to the need for specialized equipment and operators, LiDAR resources are often hard to secure on short notice. Photogrammetry equipment can fit in the back of any surveyor’s truck, and you can operate it yourself. It’s versatile. Photogrammetry technology has evolved to the point where it’s a great general-purpose imaging tool. LiDAR has more specific use cases due to technical limitations, such as the bulk of the equipment, and difficulty in obtaining high resolution images. These benefits make photogrammetry an appealing option for certain types of ground-based surveying. While ground-based LiDAR definitely has its place, the accessibility and wide application of photogrammetry has made it an easy “default” choice in many scenarios. Aerial surveying, however, is a different story. While many of the above strengths still apply, aerial photogrammetry has historically had one clear bottleneck: the aircraft itself. Renting an airplane with a specialized aerial camera could often negate photogrammetry’s key strengths – they are expensive, troublesome to mobilize, and limited in the levels of elevation and angles they can capture. Because of this, the decision between aerial photogrammetry and LiDAR has traditionally been less clear-cut. While UAVs have long been employed in military applications, they have only recently become widely available to the commercial public. UAVs have completely revolutionized the use of photogrammetry in surveying, because unlike planes, they ideally supplement the technology’s key strengths. For starters, UAVs are affordable and easily available. The accessibility of UAV photogrammetry has not only increased the popularity of photogrammetry for general surveying applications, but has created an entirely new market known as micro-mapping. This involves the surveying of sites smaller than 5 square kilometers. Historically, projects like these have been un-economical, as surveying had to be done with manned aircraft. The high mobilization costs and lengthy project timelines made it difficult for traditional surveying firms to accept these jobs. However, with UAVs that fit easily into a surveyor’s truck, providers can mobilize much more quickly and complete these small projects in under a day. Furthermore, UAVs are more versatile than planes when it comes to positioning, levels of elevation, and navigating tight spaces. This makes them suitable for a wider variety of jobs. For example, drones can be used to solve the overhead obstruction problem. Many UAVs can be programmed with an autonomous flight path known as a “waypoint”. The drone’s waypoint technology allows it to move precisely through tight areas which would be impossible for a human pilot to navigate. This, along with the drone’s compact size, enables it to take images under tree canopies and other obstructions with ease. These are just a few of the ways that UAVs have transformed aerial surveying. While both photogrammetry and LiDAR have benefited from this change, it is clear that photogrammetry is the big winner here. The reason for this is that UAVs build directly on photogrammetry’s core strengths: affordability, availability and versatility. Freed from the bottleneck of expensive aircraft rentals, photogrammetry becomes just as compelling in the air as it is on the ground. In contrast, UAV-based LiDAR is much less accessible. While compact UAV LiDAR systems are available, even these short-range systems suffer from the classic LiDAR problem of high cost and scarcity. Meanwhile, a high-quality camera costs under $500, and a professional drone can be purchased for less than $1,000. Both are widely available in general electronics stores. Popular UAV (such as DJI) also now include cameras suitable for many photogrammetric tasks. Furthermore, attempting to cut costs by using lower-end UAV LiDAR setups can compound a key problem with aerial LiDAR: low accuracy. Historically, aerial LiDAR has always suffered from much lower accuracy than its ground-based counterpart, for two main reasons. Both of these factors can be exacerbated by the use of UAV-based LiDAR. The first factor is imprecise positional information. In order to get accurate LiDAR measurements, you need to know the exact position of the emitting sensor and the point being measured. This is relatively simple in ground-based LiDAR, since the points are usually reasonably close and completely stationary. In aerial LiDAR, however, the emitting sensor is much farther away, and there is often some degree of motion. It can often be hard to tell exactly where you are, and this can distort measurements quite significantly. To solve this issue, surveying aircraft often comes equipped with real-time kinematic (RTK) GPS systems that improve the accuracy of positioning information. While this technology is starting to be included in high-end UAVs, most commercially-available UAVs don’t have RTK GPS. That means that surveyors will have to choose between affordability and accuracy – never a good trade-off. The second factor is imprecise angular measurements. Even with state-of-the-art military LiDAR sensors, the best angular accuracy you can get is in the range of 1/100th of a degree. That sounds quite accurate, and is actually often sufficient for ground-based LiDAR. However, when the sensor is on an aircraft high above the site, this can result in large discrepancies. For instance, a manned aircraft at 3000 ft with an offset of 1/100th of a degree means a 16cm sample distance on the ground. UAVs have the advantage of being able to fly a lot lower, but the lightweight sensors that can be mounted on them are also a lot less accurate, with errors on the order of 1/10th of a degree. And in this case, there is not even an option to go for a higher-end model, as the technology is just not there yet. Due to these factors, aerial LiDAR often produces data with lower accuracy than ground-based LiDAR, in the range of 15-37cm by some estimates. And UAV-based LiDAR can often compound this problem due to having less sophisticated technology. In contrast to UAV LiDAR’s accuracy issues, UAV photogrammetry can actually provide very high-quality image data using affordable and easily available equipment. The main reason for this is that each photo taken by a drone is a complete record of all the site data captured within the frame. It does not depend on supplementary information such as positioning or sensor direction. 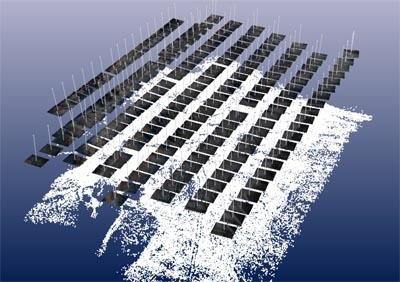 Instead, photogrammetry software constructs the model based on the relationship between different pixels within the frame. The model is also constructed on the basis of hundreds or even thousands of images with significant overlap, allowing the software to eliminate errors and fit each geographical point precisely within the model. Finally, for an extra layer of accuracy, surveyors can set up Ground Control Points (GCPs). These are positions marked and surveyed on the ground and visible from the air, that can be used as reference points in the model construction stage. If all the steps are implemented correctly, photogrammetric models can generally give +/- 8cm accuracy, or even better if required. And this can easily be done with currently available, off-the-shelf equipment. As an additional benefit, these models are rendered in full-color and high-resolution, making it much easier for humans to visually understand and interpret. In summary, UAVs build on photogrammetry’s key strengths: affordability, availability and versatility. They allow surveyors to capture much more accurate aerial survey data, while significantly reducing costs and operational difficulties. Photogrammetry has always been a key technology for surveyors, and the rise of UAV technology has simply taken it to the next level. At PhotoModeler, we’ve recognized this reality and have developed a photogrammetry suite specifically designed for use with UAV photo data. For more information on how we can help you realize the advantages of UAV photogrammetry, click here.